Black Friday is the ideal time to ditch those dusty PC parts for some shiny new ones. Of course, that’s easier said than done, especially with so many alluring options out there. 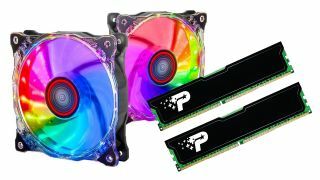 To make things buttery smooth, we’ve taken care of everything for you, and picked five of the best parts to nab: a graphics card, an SSD storage drive, some RAM, a CPU Cooler, and some extra RGB case fans. Even if you’re new to monkeying around inside your PC, these particular components won’t bust your brain when installing them. Aside from adding some thermal paste to your processor for the CPU cooler, the rest are simply plug and play. For even more Black Friday goodness, check out all the Black Friday game deals we've curated for you, as well as the best Black Friday PC deals and standout picks from all the Steam Black Friday 2018 deals. If you can afford a top-shelf graphics card, such as this lovely Gigabyte RTX 2080 Gaming OC, then by golly, hit that purchase button. But for most of us, a mid-range GPU is more realistic. And on that note, upgrading to a GeForce GTX 1070 is a worthy choice. 20 bucks off might not seem earth-shattering, but for just $340, you’ll get a free copy of Monster Hunter: World (limited-time offer), and you’ll have a GPU that can tear through graphics-intensive games at resolutions up to 1440p. The GTX 1070 is just as viable for VR, too. Plus, this particular card is a dual-slot version, so it won’t invade nearby motherboard areas that might already be spoken for. It’s worth pointing out that with a GTX 1070 you won’t get the fancy new tech from NVIDIA’s RTX 20 series, but there aren’t many games with real-time ray tracing and DLSS yet, so it’s only a minor sting. Still rocking an old-fashioned mechanical hard drive? For shame! Switching to an SSD from an HDD is like turning in a pre-owned Subaru for a Porsche. Your in-game load screens will fly by, and Windows will boot up obscenely quick as well. The Samsung 860 EVO Series 1TB grants luxurious space along with decent read and write times, making it a perfect marriage for folks on a budget. Not only that, it takes up far less room in your PC’s tower than a hard drive, and you can still keep your old HDD for file and media storage, reserving your SSD for precious games. Considering most 1TB SSD’s shoot north of $200 on average, this is the perfect opportunity to grab one. Okay, let’s be clear here: Patriot’s Signature series RAM doesn’t have flashy RGB LEDs, pumped up heat spreaders, head-spinning timings, or bundled certified tax-accountants. Instead, you’re getting some darn fine memory for criminally little money. These sticks perform admirably for most basic tasks, and they handle PC gaming well. They’re also low-profile compared to more advanced options, so they’ll stay clear of CPU coolers and other add-in items. If you can swing it, we’d suggest springing for two sets of these to get 16GB total, as that’s the sweet spot for systems these days. Just double-check your motherboard’s documentation to ensure it can handle DDR4 2400 modules in dual-channel mode or quad-channel mode (most modern mobos can). Want to squeeze some extra frames-per-second out of your processor? Before you even think about overclocking, ditch that sorry old stock cooler and install an aftermarket one. Air-cooled versions are fine and dandy, but to get the most out of potential clock speeds, and to keep your CPU as chilly and stable as possible, liquid cooling is where it’s at. An all-in-one cooler such as the Corsair Hydro Series H55 Quiet Edition would just love to make your processor’s acquaintance, and at $50, it’s a bargain. The radiator and fan combo screw in easily to the rear of your case’s interior, and the heatsink nestles itself comfortably atop your CPU. This version works with almost all processors around, so chances are it’s compatible with your setup (check the specifications tab in the Newegg listing to make sure). There’s no such thing as too many case fans. Fans are the unsung heroes of all PC’s. They selflessly keep the rest of your hardware cool and stable, and they ask little in return, except for a power connecter here and there. But why not pump your fans up a few notches with some sweet RGB lighting? Rosewill’s RGB 120mm fans do just that, and they also come with an expansion hub (for up to eight more fans), as well a 17-key RF remote control, so you can change the colors and effects at the press of a button. With a 23.2 dBA rated noise level, these fans not only look dapper - they also won’t execute your eardrums while they spin.